No amount of diet or exercise can eliminate fat in certain areas of your body. SculpSure® body contouring takes care of those lumps once and for all with highly targeted lasers. At MD Advanced Skincare, you can have a SculpSure treatment on your coffee break. 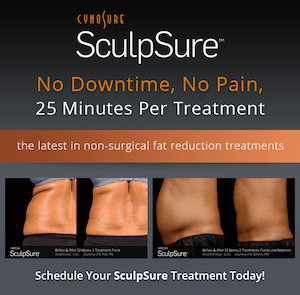 Contact the Houston, Texas, luxury medspa online or over the phone to schedule a SculpSure consultation. SculpSure body contouring is a nonsurgical fat reduction treatment using laser heat to break down fat cells. The lymphatic system then flushes those fat cells out of the body permanently. First, your cosmetic specialist assesses and marks the treatment area. Then, they have you relax on a bed while they prepare you for the procedure. Next, they place the appropriate frame against your skin and secure it with an adjustable strap. Then, they insert the applicators inside the frames. The applicators extend from the console on movable “arms.” Once the applicators are in place, your 25-minute treatment begins. Once the applicators are activated, the skin cooling system kicks in, which may feel chilly against the skin. The lasers then cycle on and off, and you might feel a deep warmth when the lasers penetrate. If you’re having multiple treatments, your specialist repeats the process for 25 minutes per area. When the treatment is over, they remove the applicators—and you can return immediately to your normal routine. What are the advantages of SculpSure treatments? SculpSure body contouring is an effective nonsurgical solution for a slimmer, sculpted look. The treatment adds definition where you couldn’t achieve it before. Requiring just 25 minutes per treatment and no downtime, the procedure provides minimal interruption to your schedule. It’s also easy to tolerate and doesn’t require anesthesia. You should notice added definition within just six weeks of treatment. Then, your permanent results should be visible within 12 weeks. As an adult, the number of fat cells in your body remains consistent. When you gain or lose weight, your fat cells expand or shrink, but they don’t come and go. Therefore, results from the SculpSure procedure are permanent. Once your fat cells are gone, they’re gone for good. It’s important to remember that you can still gain weight after the treatment, but you can’t restore those fat cells. If you want to get rid of your stubborn fat deposits, contact MD Advanced Skincare online or over the phone.